Should recognized environmental conditions (RECs) be identified during a Phase I Environmental Site Assessment, Federated Environmental further investigates the environmental concern through implementation of a testing project called a Phase II Environmental Site Assessment. A Phase II Environmental Site Assessment typically includes sampling and chemical analysis of building materials (asbestos, lead), solid wastes, drummed chemical wastes, soil, groundwater, surface waters, or other suspected hazardous materials. Data from the sampling effort is compiled and compared to federal and state published contaminant guidelines. 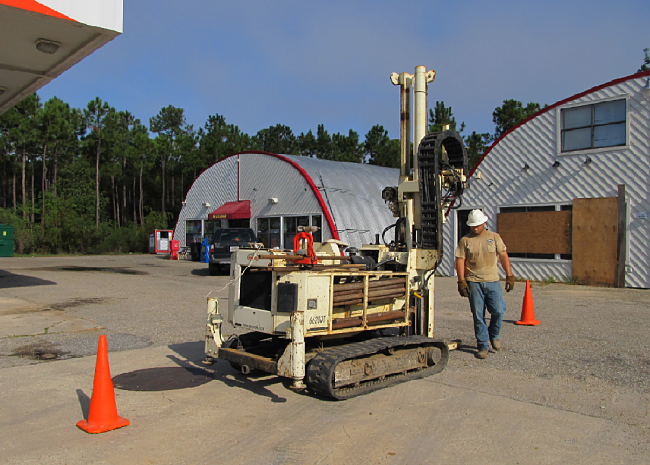 Above, Geoprobe installation of soil test borings and temporary monitoring wells (Gautier, MS). 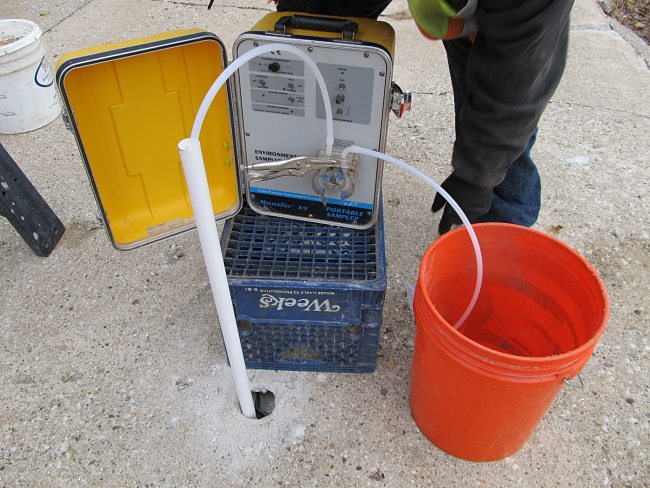 Below, development of a 2″ groundwater monitoring well using a peristaltic pump (St. Joseph, MI). Phase II Environmental Site Assessments are testing projects are designed to confirm or deny environmental contamination and quantify environmental risk. Federated Environmental is experienced in designing and completing Phase II Environmental Site Assessments (ESAs) in accordance with the American Society for Testing and Materials (ASTM) Standard for Environmental Site Assessments: Phase II Environmental Site Assessment Process, State and Federal requirements and customized to meet client needs and budgets. Federated Environmental has completed thousands of Phase II ESAs nationally at all types of sites and geologic settings and tested for variety of contaminants. Prior to implementing a Phase II ESA, Federated Environmental confirms a strong understanding of the client goals and project. The scope of work is designed to meet the scrutiny of the various parties involved including commercial lenders, federal and state regulatory agencies, attorneys, and industry peers. Federated Environmental has service agreement contracts with over twelve national Geoprobe®, hydraulic, continuous flight auger, and sonic drill rig contractors which allows for control of scheduling and costs. Federated Environmental was notified by an office building management company of gasoline odors in their elevators and was asked to investigate. Federated Environmental developed a comprehensive subsurface investigation of the office property and discovered that the gasoline fumes were coming from an abandoned gasoline station located on an immediate adjacent property. The gasoline station was listed as a leaking UST site, but it appeared that no efforts were being made to address the station property. Federated Environmental determined that the depth to groundwater in the area was 85’, and that gasoline from the station had migrated downward to the groundwater and moved laterally underneath the office building. The oil company that owned the gasoline station began cleanup and compensatory activities quickly after reviewing the Federated Environmental report on the investigation. Federated Environmental was retained to perform a subsurface investigation of a small commercial nursery in New Jersey. A Phase I Environmental Site Assessment of the property revealed significant quantities of hazardous pesticides (DDT, 2,4 D, heptachlor, toxaphene, lindane, TEPP, and others) on-site in broken bags, jugs, sprayers, and other containers. The site has two dug wells that were used for water and consumption purposes. Federated Environmental, through the completion of its planned subsurface investigation protocols, discovered these chemicals and others at dangerously high levels in the groundwater and well water. In addition, the data revealed that the contamination had migrated into the groundwater underneath the adjacent streets. No contamination was confirmed on nearby properties, although the federal EPA issued an administrative order for the nearby properties served by wells to install special water treatment systems. The report was provided to the Federal Deposit Insurance Corporation, who in turn determined that the asset was too contaminated to sell off. The property is listed as a federal Superfund site, a state hazardous waste site, and is currently abandoned. The site sits abandoned to this day. Contaminants do not respect property boundaries. Contaminated groundwater flow will travel according to hydrogeologic principles regardless of tax maps, metes and bounds descriptions, and fence lines. Groundwater flows from areas of recharge to discharge which often corresponds with topography. Overall, groundwater flow is quite slow and most often measured in inches (or fractions of inches) per year. 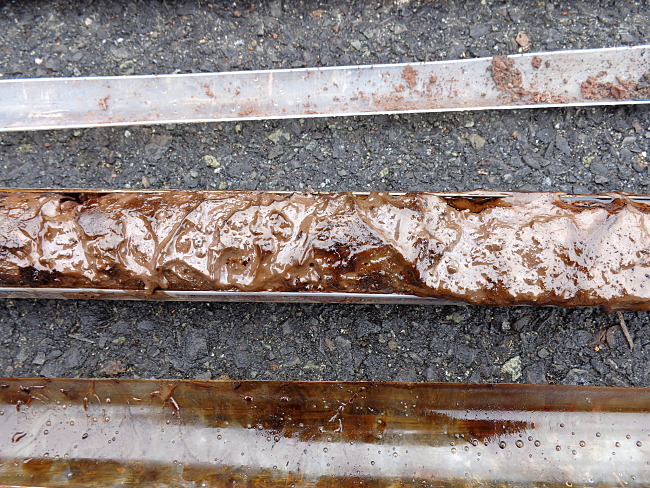 Hydrogeologists call this hydraulic conductivity, or the K-value.